A tufted perennial herb, 10-15 cm tall, arising from a rather stout, single or branched rootstock. Leaves: Each rootstock or branch has a tuft or rosette of numerous, thick to almost fleshy, overlapping leaves. Leaf blade 1-1.5 cm long by 5-7 mm wide, bright to deep green and shining above. Flowers: White, 1.5-1.8 cm long, produced singly or in two- to six-flowered clusters. var. australis: Differs mainly in its stouter habit of growth and larger flowers. It often forms dense, low patches 6-12 cm across, and the abundantly produced flowers are up to 2.5 cm in diameter. 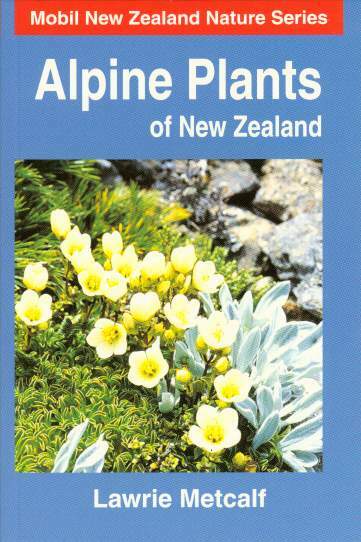 North and South Islands in subalpine to high alpine regions from Mt Hikurangi southwards; widespread but often local. 600-1800 metres. 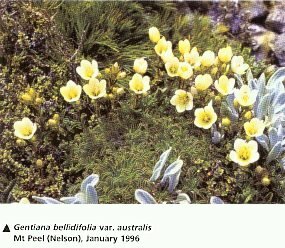 Usually occurs in damp grasslands, herbfields and boggy places. var. australis is confined to high alpine regions of the South Island mainly about and west of the main divide. It occurs mainly in fellfields, on rock faces and on bluffs. Identification: Of the 24 or so native species of gentian this is one of the finest as well as one of the most commonly seen. The almost fleshy leaves, with deep green and shining upper surfaces, and the prominent heads of quite large flowers are usually sufficient to identify it. Flowering: Typical form  between January and March; var. australis  during February and March. Depending on the season flowering may continue into April.